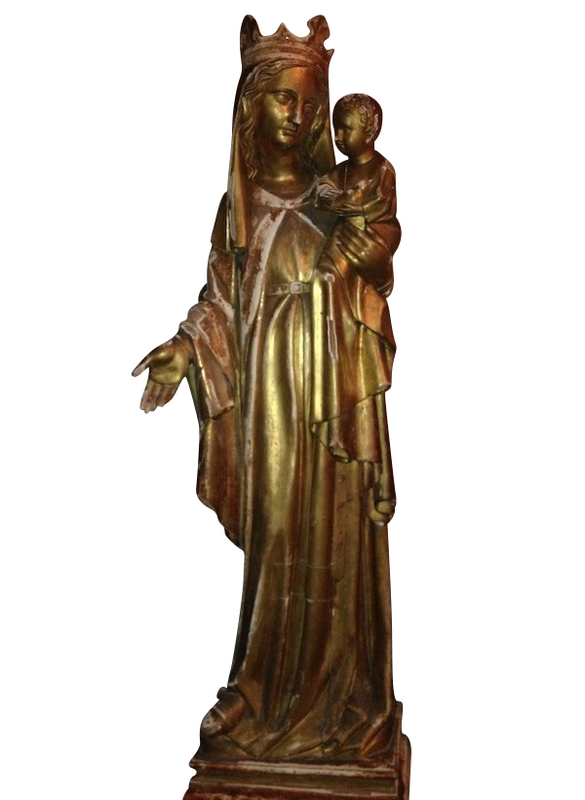 (SOLD)Sculpture adds immeasurably to the feel of a room, and yet is comparatively rare in shops in Australia in any size over about 60 cm tall. This wonderful carved wood sculpture, probably French rather than Spanish, shows the gentle contrapostal position that makes such a fluid and beguiling figure. She is very graceful. The surface is richly patinated with the now complex interplay of the visible layers of the wood, the gesso, the red bole, and the gold leaf. Delicious! 1.1 metres tall. Footprint 33 cm by 25 cm. We do have a gallery style white double-cube pedestal at 802 High St that would suit it very well. * If you are still living in your untouched 1990s Minimalist home, heritage list the interior immediately, and be cutting edge fashionable! Style might be immortal, but fashion is a game that can be lots of fun. It is not capricious, it always comes back to almost where it was before. A coil spring is a good visualisation of its nature. "The Devil wears Prada" is a seriously instructive metaphor. * If you are still living in your untouched 1990s Minimalist home, heritage list the interior immediately, and be cutting edge fashionable! Style might be immortal, but fashion is a game that can be lots of fun. It is not capricious, it always comes back to almost where it was before. A coil spring is a good visualisation of its nature. “The Devil wears Prada” is a seriously instructive metaphor.